Coaching unleashes a person’s full potential and maximizes their impact on the world. A coach sees an individual in all their magnificence and uses a variety of methods that guide them to find their own answers. Co-Active® Coaching is Personal Development at its most impactful. It’s holistic, focusing on the entire body- mind, soul and spirit. It addresses emotions and dreams- fears and goals; action and psychology. It connects the dots of the whole person. It deals with our fulfillment and our search for meaning, as well as our understanding as to who we are and what we want from all the clutter in our mind that holds us back. At Leadership Coaching, we have hand-picked our Co-Active® coaches to simplify and facilitate your search for highly skilled Co-Active® coaching. By using the Leadership Coaching platform, you can interact with a coach before making a commitment. Great coaches can change a life! Each of our coaches is Co-Active® certified by the Coaching Training Institute (CTI). A leader in its field for over 25 years, CTI has trained more than 55,000 Co-Active® coaches worldwide. This is a style of coaching applied for personal and professional development, presently available in 19 countries, with the focus towards realizing your full potential and achieving a more fulfilling life. Leadership Coaching assembled a team of CTI faculty members who have been carefully selected for their quality, diversity and passion! Most of our facilitators have undergone three additional years of rigorous training with CTI due to their position as faculty. This enables them to use specific coaching skills, while coaching in a way that empowers you, the coachee, to unearth your talents and accelerate your personal and professional development. A Co-Active® coach expands the best version of yourself and shows you new ways to lead your life! We all hold and explore different roles in our life- be that of a parent, educator, manager and can be overwhelmed by the responsibilities and challenges that are attached to such roles. A coach will guide you, support you, acknowledge you, challenge you, and see the best in you, while being truly responsive to your needs. By identifying habits that detrimentally affect you, enhance your strengths and helping set goals with specific steps to achieve them, you will be empowered to create the change you want for yourself. A coach works with you in any and all areas of your life. They help you recognize that any personal development you achieve in one area of your life spills over into most others. How can I improve my relationship with a specific colleague, a friend, a relative? Typically, coaching sessions last between 45 and 90 minutes, depending on the coach and coachee’s agreement. A minimum commitment of three months is usually required, as coaching is a process rather than a single event. Coaching sessions can take place in person, by telephone or via Skype™ or Zoom. Coaching fees for Personal Development begin at €150 an hour, and if you’re interested in Corporate Coaching fees, please contact us at info@leadershipcoaching.gr. What is the role of a Co-Active® coach? A Co-Active® coach believes you, the coachee, is already great. Their job is to ask powerful questions, listen and empower to bring forth the skills and creativity you already possess, rather than instruct or advise. Co-Active® coaching uses an array of proprietary tools developed by CTI. You are Naturally Creative, Resourceful, and Whole– meaning you are not broken, you don’t need fixing, you have all the answers within you and it’s your Co-Active® Coach’s job to get the answers out by simply discovering, uncovering or polishing the individual you already are. You and your Co-Active® Coach Dance in This Moment, meaning, you both embrace where you are now as you begin to move towards your desired life vision. Everything that is happening in this moment is an opportunity for learning and movement. The Co-Active® Coach’s role is to Evoke Transformation in you – to call you forth in to your desired life with more balance and fulfillment. This means that the coach / coachee relationship is focused on getting the results that you want, not what the coach or anyone else thinks is best for you. Co-Active® Coaching Focuses on Your Whole Person–because we are human beings and not human “doings” set to perform a specific function, we often cannot separate the different aspects of our lives into neat little boxes. In some way, everything is connected and so Co-Active® coaching relationships must be able to work with facets of every area of your life: home, family, work, relationship, and so on. The Designed Alliance is the agreement that you and your coach create together, to maximize the benefit of coaching. Every alliance is unique as it has the ability to change and shift with the needs of the coaching relationship and the specific client. The designing of the alliance is done in the early stage of the coaching relationship where you and your coach talk openly about how you’ll work together. Forward the action / deepen the learning. 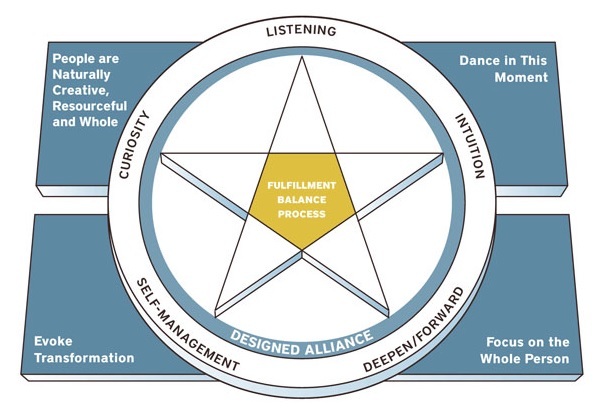 Together within the Designed Alliance you and your coach fashioned, these contexts will help to create the foundation in which the coaching unfolds. Fulfillment– what do you truly want for your life? Each person’s concept of what is fulfilling is unique and intensely personal. Fulfillment is available to each of us today, in each moment, by living in harmony with what we most value now. Balance– working from the perspective that you always have choices. By approaching a coaching session from the principle of “balance”, your coach determines what perspective you, the coachee, is holding about the issue in question, and then brainstorm together and explore other possible perspectives to give you access to a variety of choices. Process – living fully present in the moment. Your coach’s function, at times, will be to just be with you where you are, and help you to go through the process so that you can get to the other side. Your Co-Active® coach will support and hold you accountable. They ask the questions, and you answer them. You’ll set important and meaningful goals and move towards achieving them. They will challenge you, love you and believe in you, even more than you believe in yourself. Contact your coach with one easy click and schedule a consultation. The first call is free to ensure that they are the right fit for you.